One of the most exciting players in all of the 2018 NBA Draft is none other than former Texas Tech star, Zhaire Smith. The former Red Raider became Texas Tech’s first one-and-done player in school history, and, just to add to the intrigue, Smith is also one of the biggest mysterious in the 2018 NBA Draft in so many ways. As a three-star recruit coming out of Lakeview Centennial in Garland, Texas, Smith was not heavily scouted going into his freshman season, but with hard work and determination, his game has grown to a point that Smith is a potential lottery selection. Smith appeared in 37 games for Texas Tech and started in 21 of the final 22 games of the season, which energized the Red Raiders and helped propel them all the way to the Elite Eight for the first time in school history. Smith’s breakout game came during the First Round of the NCAA Tournament when Texas Tech earned an opening round victory over Stephen F. Austin. Smith didn’t post the best stats that game, just 10 points on 4-8 from the field, but his signature moment came when he put down one of the best dunks in college basketball last season. That dunk set the college basketball world on fire as casual fans were finally able to see Smith’s talent displayed on the national stage. During his one year at Texas Tech, Smith averaged 11.3 points and five rebounds while playing 28.4 minutes per game and finished the season as the Big 12 newcomer of the year. That was just the first award for Smith as he also was awarded with All-Big-12 Honorable Mention and also was voted as a member of the All-Big-12 Defensive Team. Those accolades seem to be just the start for Smith as he seems poised to reek havoc in the NBA next season. As one of the most dynamic athletes in the draft, Smith is a potential fit with the Nuggets because he fills a need for them, they have already had Smith in for a workout, and they met with him at the combine. During Smith’s workout with the Nuggets, he showcased a jump shot that seems a lot more compact than the one he showcased in college. After shooting a whopping 45 percent from behind the arc, teams are looking into Smith’s outside jumper with curiosity considering he attempted just 40 three-pointers in college. It looks as if Smith has made it a point of emphasis to hone in on his mechanics and make his shot a little more consistent than it was last season. Here’s an example of how Smith’s shooting mechanics looked from behind the arc during the NCAA tournament. The mechanics certainly seem different, and it is something Smith is showing teams throughout the pre-draft process. After just one season at Texas Tech, it seems as if teams want to find out more on Smith with the number of workouts he’s done. Even after a solid freshman season, Smith still has a lot to prove, and it’s something he discussed after his pre-draft workout with the Nuggets. “My ability to shoot the ball, handle the ball, and play hard on defense,” Smith said when asked about what he wants to prove during his workouts. Smith has worked out for seven teams already during the pre-draft process — Charlotte, Denver, Los Angeles Clippers, New York, Philadelphia, Phoenix, Washington — and flashed eye-popping numbers at the NBA combine where he posted a max vertical leap of 41.5. Smith’s vertical leap wasn’t even his most eye popping number as he also posted a solid three-quarter sprint time of 3.04. Those numbers just show Smith’s freakishly athletic ability, but the real question is if he’ll be able to transfer that athleticism to the next level. That question and more will be answered as we take a dive into one of the 2018 NBA drafts most exciting prospects. We touched on this just a second ago, but one thing that Smith does extremely well is his ability to not just be an athlete, but to be an athlete with effectiveness in all aspects of his game. What that means is Smith does a fantastic job of not just throwing down monster dunks at the rim, but he also has a solid foundation of how to use his body moving side to side on defense, blowing by guys with his first step when the ball is in his hands, and even the ability to create fast-break opportunities with his play on the defensive end of the court. During his one season with the Red Raiders, Smith showed flashes of big-time potential on the offensive end of the floor. Smith’s greatest offensive strength is when he can play off-ball and hit spot-up shots or cut to the rim for big-time poster dunks. According to Synergy, spot-up shooting is one of Smith’s best assets. He shot 42.4 percent from the field last season on spot-up attempts albeit on a small sample size. Smith’s athletic ability is highlighted by his speed and agility to bait his defenders into no-win situations. Since Smith is effective as a spot-up shooter, it makes defenders have to respect that part of his game. That is when he’s able to cut back door and get an easy shot at the rim. This is the most efficient part of Smith’s game. He scored 104 points off of cuts and finished at a 67.7 percent clip. Just like we touched on with Miles Bridges in the last player profile, cutting has become a staple of the Nuggets’ offense and it seems like Smith would be a natural fit in the Nuggets unselfish offensive system. Quite possibly the greatest thing that Smith would bring to the Nuggets is his ability to be a lockdown defender. During his one season at Texas Tech, Smith showcased a high motor and tenacity to be a successful player on the defensive end of the floor. As an instant-impact defender, Smith does a great job of switching and having an urgency on defense that a lot of prospects don’t posses. At Texas Tech, the type of defense they play is very similar to how NBA teams defend because of how often they switched ball screens and defended multiple positions. Smith thrived in Texas Tech’s defensive scheme and showed that his high motor isn’t just on the offensive end of the floor, but that his defensive motor is just as strong. Smith’s tenacity was on full display there as he sagged off his man in order to play effective help-side defense and effect the shot at the rim. Jevon Carter is a potential top-40 selection in the 2018 NBA Draft and is arguably one of the best point guards set to be drafted, but Smith showed no care in the world as he was still able to catch up to the speedy point guard and annihilated his shot at the rim. During his only season at Texas Tech, Smith averaged 1.1 blocks per game and finished the season with 13 games with multiple blocks. Smith’s best rim protecting game came against Texas Christian on February 3rd when the freshman recorded a career-high four blocks to go along with his 12 points. This is just another example of Smith playing solid help-side defense and showcasing an ability to switch on defense multiple times within a possession and not get lost at the same time. His IQ, awareness, and effort the things that gives him the chance to be an elite defender at the next level. With a wingspan of six-foot-10, Smith also does a great job creating steals and not allowing his opponent to make weak or lazy passes. Smith’s wingspan gives him the ability to get in passing lanes and disrupt entry passes or passes outside the three-point line. Sloppy passes turn into runout dunks when Smith’s around, and it’s the biggest reason as to how he averaged 1.1 steals per game last season. His steal numbers allow him to showcase his game in transition, which is big for a guy with a three-quarter sprint time of 3.04. The motor in which Smith plays with on the defensive end of the court is on full display when he’s blocking shots and stealing passes and it’s what makes him one of the best defensive players in this class. If Smith bulks up and gets stronger, there’s no telling just how dominant he’ll be for whichever team drafts him. As a rebounder, Smith is able to excel more on the offensive end of the floor than on the defensive end. With just one collegiate season under his belt, Smith averaged a solid five rebounds per game with almost half of those coming on the offensive glass (2.2). For a six-foot-five combo guard, that number is almost unheard of and is a testament to Smith’s high basketball IQ and unbelievable motor. “Just the hard work I put in, and just the things that don’t really show up on the stat sheet. My coach (Chris Beard) prided on me to crash the board every time and I did that,” Smith told the Denver media after his workout with the Nuggets. Smith also talked about the “offensive rebounding chain,” which is an actual chain that given to the Texas Tech player who records the most offensive rebounds in a game. Whoever wins that game gets to wearing the chain the next day. Smith joked that he ended up wearing the chain a lot. The ability Smith has to destroy the offensive glass goes back to his work ethic and tenacity that he brings to the court on a nightly basis. 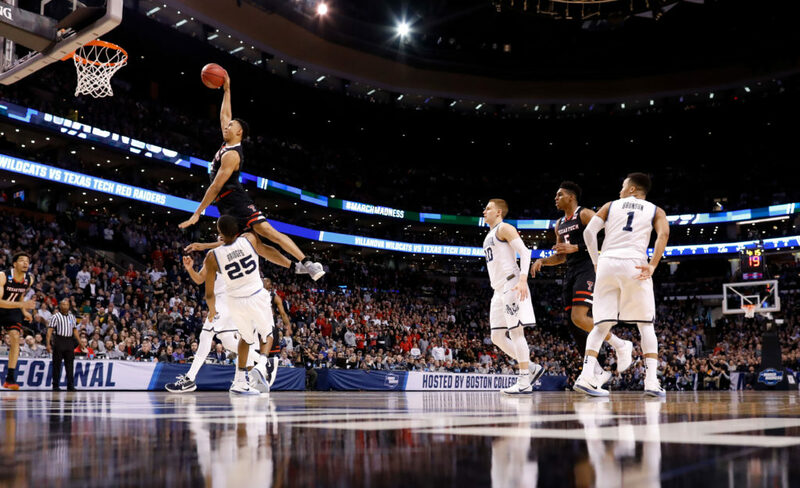 Offensive rebounding isn’t always about positioning or how well you can block out a defender; sometimes it just comes back to athletes being athletes and making special things happen for their team. Smith catches the defense napping and makes them pay with the poster flush in the NCAA Tournament. Guys who have motors like Smith are hard to come by, and it’s a real reason as to why he has the potential to be a lottery pick on Thursday night. This is one of Smith’s biggest weaknesses only because playing on the perimeter is a somewhat new facet to his game. Coming out of high school, Smith predominately played center and was naturally moved to power forward at the collegiate level. Not many centers are six-foot-five and neither are many power forwards, which has forced Smith to try and mold his game into a combo guard that can play both the two and the three. Mile High Sports very own T.J. McBride asked Smith what that transition has been like going from playing down low a lot in high school to now being asked to play on the perimeter and go against smaller defenders. “It is not that big of a transition. I’ve been playing the wing, it is just better guards guarding me cause I usually have a big man on me. But, it’s just different cause the guards are guarding me now,” Smith said. One thing Smith will have to improve on is his ability to go against smaller defenders and have success when those mismatches do occur. In this video Smith clearly has the height advantage over Oklahoma guard Trae Young, but Smith still forces up a tough contested shot that almost had no chance of going in. Smith was below average in isolation last season and scored just 23 points in 39 possessions. Even though that part of Smith’s game was a weakness in college, there is no way of knowing whether whomever drafts Smith is going to ask him to be able to isolate at the next level. Smith’s inefficiencies scoring in isolation in college suggest that teams won’t ask him to do that right away and will ask him to play more off ball and as the teams primary defender. For example, if the Nuggets draft Smith, he would in no way be a guy who they expect to score with the ball in his hands without help. Smith would most likely be asked to be a spot-up shooter, bring energy, and defend with tenacity. So, even though going against smaller defenders one-on-one is something Smith needs to work on, it might not be something he’s asked to do right away at the next level. As athletic and tenacious as Smith is, it can sometimes cause him to play frantic, which forces him into out-of-control dibbling and horrendous turnovers. Below are two turnovers that Smith had against Baylor last season. Watch closely at how out of control Smith is and how he’s just trying to do to much when nothing is there. Something Smith will have to learn at the next level is to take what the defense gives him and to not try and do to much. Smith got in trouble last season when he attempted to score in isolation and his ball handling was the biggest reason as to why that part of his game wasn’t successful. Not only does Smith’s ball handling force him into bad turnovers, but it also forces him to take tough contested shots. His shooting off the bounce is highly inconsistent and forces him to alter his shot angle since he isn’t able to create separation from his defender. Smith’s inconsistency off the dribble forces him to shoot his shot on the way down, which is completely opposite from the way he shoots when he’s spotting up. A normal Zhaire Smith three-pointer looks like a short, compact stroke, that usually goes through the center of the basket. Smith’s shot off the dribble though is completely off balance and causes a sort of hitch in his shot that forces him to shoot it on the way down. It’s a problem similar to what former Nugget’ Emmanuel Mudiay had, but certainly not to the extreme that the former Nuggets’ point guard let it get to. The last clip of Smith’s weakness off the dribble is his inability to create for others when the ball is in his hands. Smith gets pick-pocketed on a two-on-three and forces Texas Tech out of a chance for an easy fast-break layup. If Smith’s ability to handle the rock could take a step forward, than that’s the difference between his team potentially winning a game or losing it. Luckily for Smith, his problems are more nit-picky at this point and can easily be fixed with NBA coaching. If the right organization and coach gets their hands on Smith, he could potentially turn into a three-and-D monster who could dominate the NBA for the next decade. In summary, Zhaire Smith has the potential to be one of the best players from the 2018 NBA Draft. His high flying ability and functional athleticism makes him a player who could give opposing teams fits for many years to come. The drive, passion, tenacity, and basketball IQ that Smith plays with will be a welcome sight for whatever teams drafts him. Like all top prospects though Smith does come with a little risk. His ball handling and shot making off the dribble are certainly a cause for concern, but those are things that should be able to develop at the next level with the right coaching and guidance from whichever team drafts him. That team might be right here in Denver as the Nuggets are looking for a player who is team-oriented and can be a force on both ends of the court. With the potential loss of Torrey Craig and with Wilson Chandler still undecided on his player option, the Nuggets are desperately in need of help on the wing. The 19-year-old combo guard out of Texas Tech might be that guy who fits the bill for the Nuggets and fills a position of need right away. Smith’s draft range seems to be in the 9-17 range, and the Nuggets would be wise to consider him at 14 if none of the other players they like fall down the board to them. With Smith already meeting with the Nuggets at the combine and working out with the team in Denver, there’s certainly some interest there from the Nuggets perspective. The Nuggets perceived interest in the high flyer makes him a name to watch for them on Thursday night and is a guy who might end up here in Denver when the 2018 NBA draft is all said and done.